Guys, I am all over the Halloween socks. 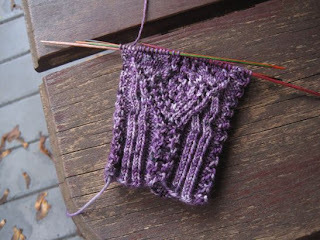 Apart from some time out to get a different sock's heel far enough along to be travel knitting, I have done nothing but lace charts for - what, is it two days now? Even though there has been laundry (five loads yesterday, including the Christmas tablecloth which I guess must have been sitting in the basket for a while). Even though there is a really very dangerous amount of Halloween candy in the house (of which I think I may actually be sick now, wouldn't that be great? and if not I can put it in the garage for the 10 days it still has to wait before I can unload it on random children). Isn't it a doozy? 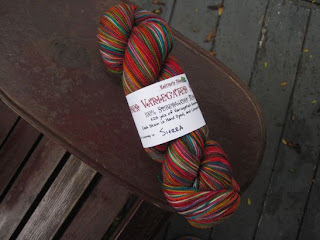 It's variegated yarn from Knitterly Things and if I had more needles available and my Slughorn sock kit wasn't murmuring my name, I might weaken more than I did when I unwrapped it. As it is, it's sitting out on the table so I can wind it into cakes and Be Ready because the socks I make with it are gonna go with everything. On reflection this doesn't seem like much sock, but the lace is quite absorbing and TCM ran some pretty absorbing movies yesterday so, you know. At least I haven't had to frog back yet! I miss one critical round, but I noticed it a round and a half later so I don't count that. Honest mistake really. Hope you guys have a great weekend, with or without an exciting purple project in it - see you Monday!